Last weekend we traveled to Seaside, Florida with our good friends, David and Trace, for the 30A Singer Songwriter Festival. The festival hosts many great singer/songwriters including Suzanne Vega, Mary Chapin Carpenter, Shawn Mullins, and Lucinda Williams. We also heard some fantastic music from artists I was not familiar with, such as Daphne Willis, The Shadowboxers, a great band from Atlanta, and Allison Moorer. I had forgotten how much I loved hearing live music. Many of the venues were smaller spaces which made the performances much more intimate. Here we are waiting for Mary Chapin Carpenter. Pictured are Trace, David’s sister, Jennifer, David, and me. Sunday night we dined at Bentley’s where we heard Shawn Mullins. For dessert, we had key lime pie which started a conversation about my favorite sweet treat. 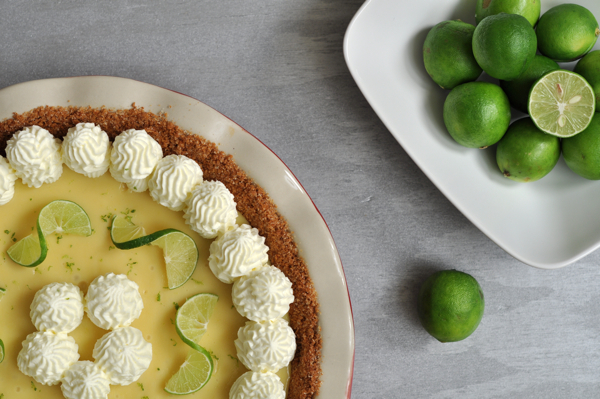 Trace volunteered that he had a great recipe for key lime pie and since it is my favorite dessert, we decided that it should be my next blog post. Key limes differ from traditional limes in taste and size. They are smaller and more tart than their larger relatives. In doing a little research on key limes, I discovered that they turn yellow as they ripen. However, they are harvested while they’re still green. The skin is much thinner than traditional limes as well. Key limes are usually available in supermarkets. My favorite part of this pie is the combination of whipped cream and sour cream topping. Depending on whether you spread the topping or pipe it with a pastry bag and how much topping you want, you might want to consider doubling that part of the recipe. I doubled the ingredients and used about three quarters of it. 2. Mix graham crackers, sugar, and melted butter in bowl. Press firmly into pie pan. 3. Bake for 20 minutes or until crust starts browning. Remove from oven and allow to cool. 5. Combine sweetened condensed milk, lime juice, and egg yolks. Pour mixture into cooled pie shell. Bake at 325 for 15 minutes. 6. Cool on counter top and then refrigerate for 2 hours. 7. Whip together the sour cream, whipping cream, and powdered sugar with an electric mixer. 8. Spread or pipe (with a pastry bag) cream mixture on cooled pie. 9. Garnish with lime zest and sliced limes. There is nothing my dad enjoys more than key lime pie. Thanks so much for sharing! I’ve never made a key lime pie, but I have certainly eaten quite a few. It is my favorite cream pie, right up there with banana. Yours looks irresistibly delicious!!! Do you ship? 🙂 I love going to music festivals. We use to go to the New Orleans Jazz Fest, but then it got too crowded. It was nice while it lasted. Great pictures of the pie and the fun! We love Seaside. I know that was fun! I like the whipping cream, sour cream and powdered sugar combination. Can’t wait to try it.